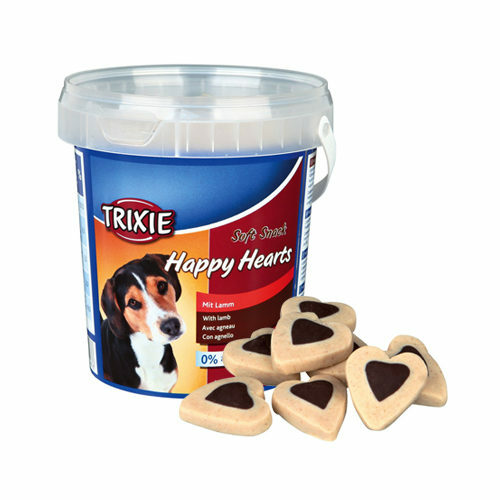 Trixie Soft Snack Happy Hearts are delicious snacks for your dog. The soft dog treats have a tasty lamb flavour and do not contain any sugars. The snacks come in a handy, resealable bucket so that you can keep the treats fresh. Trixie Soft Snack Happy Hearts are delicious dog treats that you can give to your dog as a snack or reward. The snacks are soft and have a delicious lamb flavour. What's more, these snacks do not contain sugar! The treats come in a handy re-sealable bucket. Have you used Trixie Soft Snack Happy Hearts before? Let us know what you think about this product.